The graphs provide a helpful way to visualize the relationship among cost, volume, and profit. However, when solving problems, you’ll find that plugging numbers into formulas is much quicker and easier. Pemulis Basketballs sells basketballs for $15 each. The variable cost per unit of the basketballs is $6. Pemulis had total fixed costs of $300 per year. Fixed costs are represented by a horizontal line because no matter the sales volume, fixed costs stay the same. 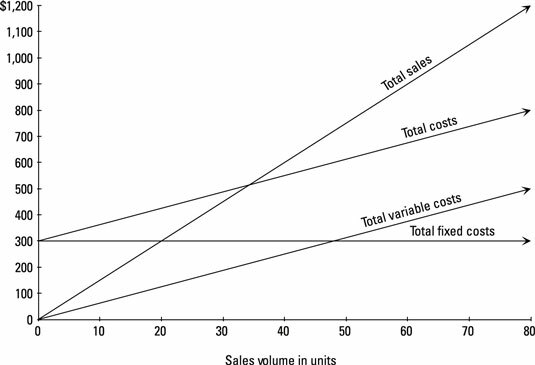 Total variable costs are a diagonal line, starting at the origin (the point in the lower-left corner of the graph where there are zero sales). Total costs (the sum of total variable costs and total fixed costs) are a diagonal line starting at the $300 mark because when the company makes and sells zero units, total costs equal the fixed costs of $300. Total costs then increase with volume. Finally, total sales forms a diagonal line starting at the origin and increasing with sales volume. The figure shows when the company will earn net income or incur a loss. 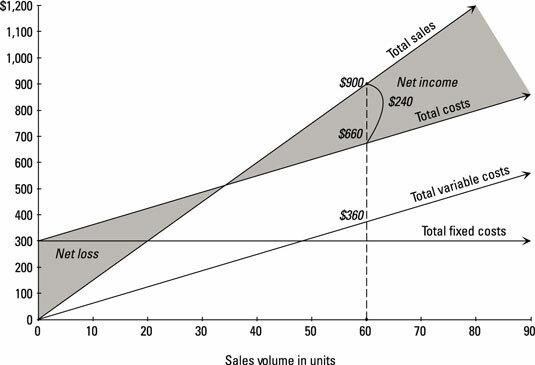 When the sales curve exceeds total costs, the company earns net income (represented by the shaded right side of the X). 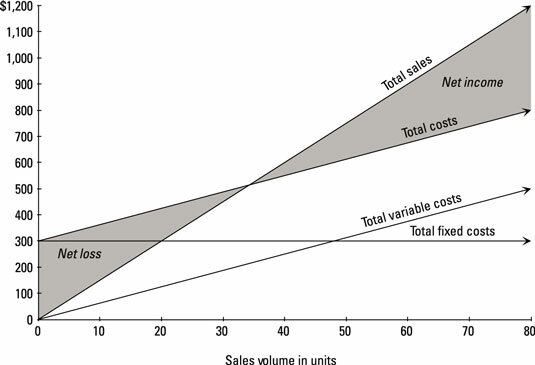 However, if total sales is too low to exceed total costs, then the company incurs a net loss (the shaded left side of the X). The higher the sales volume — that is, the more sales volume moves to the right of the graph — the higher the company’s net income. Dropping numbers into the chart shows exactly how much income can be earned at different sales levels. Assuming Pemulis has a sales price of $15 per unit, a variable cost per unit of $6, and total fixed costs of $300, what happens if Pemulis sells 60 basketballs? Total sales come to $900 (60 units x $15). Total variable costs multiply to $360 (60 units x $6). Add these total variable costs to total fixed costs of $300 to get total costs of $660. Total sales ($900) sits on the Total sales line. Total costs ($660) sits on the Total cost line. The difference between these amounts ($240) represents the net income from selling 60 units. The following formula, based on total contribution margin, follows the same structure as the contribution margin income statement. Assume that Pemulis Basketballs sells 60 units for $15 each for total sales of $900. The variable cost of each unit is $6 (so total variable costs come to $6 x 60, or $360), and total fixed costs are $300. Using the contribution margin approach, you can find the net income in two easy steps. This total contribution margin figure indicates that selling 60 units increases net income by $540. To calculate net income, subtract the fixed costs from the total contribution margin. Subtracting fixed costs of $300 from total contribution margin of $540 gives you net income of $240. If you want to estimate net income but don’t know total contribution margin and can’t find out the contribution margin per unit, you can use the contribution margin ratio to compute net income.